…while non-Christians defended Christianity quite well, for every other religion, there was an honest struggle. Lesson learned? Christianity was well defended because every single non-Christian in the room knew a Christian personally. Everyone had a Christian neighbor, co-worker, classmate, even family member. And this interaction was more powerful than the vitriol spewed from the likes of the KKK and WBC. Meanwhile, all too many had never met a Hindu on a personal level. Few had interacted with Jews, and even fewer had ever truly engaged a Muslim. It is personal interaction with our neighbors from other groups that brings interfaith harmony. Quite often, we realize that we are not so different. Coincidentally, this past weekend, I was the target of an “interfaith engagement” myself. It’s not often that I’m approached and asked about my religion. More commonly, in public places, I tend to be the object of awkward stares. However, last Saturday, while I was waiting for a table at a local burger joint, there was one person who broke through the silent hesitation. I turned around to see a middle-aged white man approach me. He was a big man, wearing a hooded grey sweatshirt and blue jeans. He was completely bald, wore dark-rimmed glasses and had a goatee. He probably shaved his head. He explained to me that he was a trucker and drove by several Sikh temples (Gurdwaras, as we call them) on the highway. 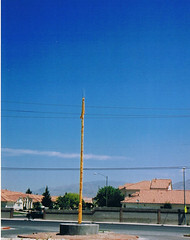 He noticed that outside every temple, there was a large pole that was wrapped in fabric, with an “arrow” on top. He was wondering about that arrow. I was impressed that he knew enough to recognize a Sikh temple, and me as a Sikh. What he was asking about is the Nishaan Sahib, a flag that stands outside every Gurdwara in the world. I explained to him that it was a religious symbol that marks our temples, so that we know there is one in the area, and that the “arrow” was actually a double-edged sword that is a religious symbol for Sikhs. He nodded his head and smiled as I explained this, and seemed satisfied with that answer. He thanked me, shook my hand, and went to his table in the restaurant. Afterwards, I wondered about the different things people observe about Sikhs that I don’t realize. I am used to seeing the Nishaan Sahib, and it has significant meaning to me as a Sikh, but I never thought about how this is perceived by others. It also occured to me that while the Nishaan Sahib marks the location of a Gurdwara, it’s also an arrow to every Sikh. It led this man to ask me a question about Sikhism. In this briefest of interfaith engagements occuring in a local burger place, two people left with full stomachs, and with a little more understanding about each other. Great blog, and great post. Thanks for putting this up.